Let’s take a look at this infographic. 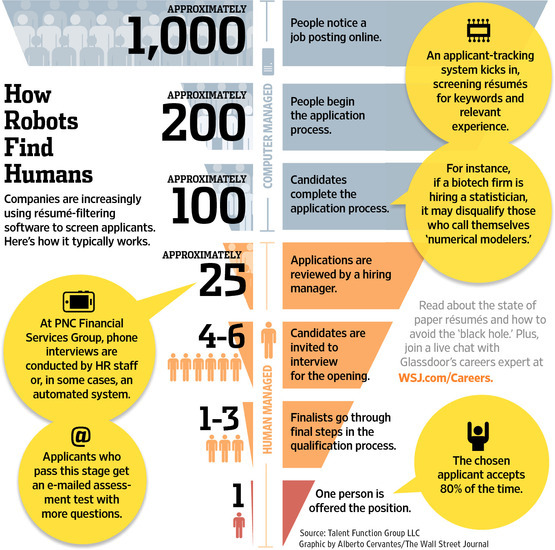 What this is saying is that: for every 1000 people that see a job posting, only about 100 actually complete the application. If the company you applied to uses a resume scanning software, only 25% of those applicants make it through to a live human being. Of those 25% that made it to a live screening, only 4-6 get selected to interview. Only about half of those interviewers get selected for final round interviews. And, only ONE gets offered the position. The numbers are shocking, aren’t they? So, now you ask… why isn’t my resume making it through? Simple answer: you don’t have the right keywords in your resume. This is how a resume scanning software works. A recruiter puts certain keywords from the job description (example: enterprise sales, solution selling, consultative, SaaS, Cloud). Any resume that comes through the system that does NOT have those keywords, automatically get thrown into the “reject” pile. The resumes that DO have those keywords, move forward in the process. While not all companies use this scanning tool, the ones who do are looking to narrow down their candidate pool to ones that have the highest probability of being a match for what they are looking for. Take the time an customize each and every resume you’re sending in. It sounds like a hassle, but as statistics show, you’ll have a much better chance of making the “cut” if you can identify keywords from the posting and insert them into your resume. It takes a mere 5 minutes, and can save you the heartbreak of another rejection email. As always, keep your head up! The search for your dream job isn’t easy, but it WILL be worth it!